This article summarizes the works established in Advanced Communication for Exa (ACE) project. 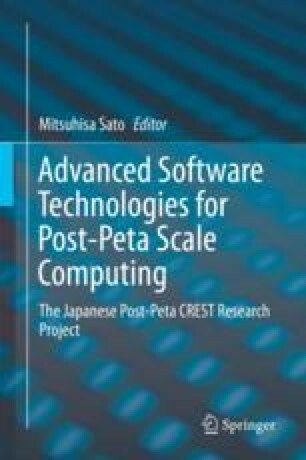 The most important motivation of this project was the severe demands for scalable communication toward Exa-scale computations. Therefore, in the project, we have built a PGAS-based communication library, Advanced Communication Primitives (ACP). Its fundamental communication model is one-sided, based on PGAS model, so that it can consume internal memory footprint as small as possible. Based on this model, several applications including simulations of magnetohydrodynamic, molecular orbitals, and particles were tuned to achieve higher scalability. In addition to that, some communication optimization techniques have been investigated. Especially, tuning methods of collective communications, such as message ordering, algorithm selection, and overlapping, are studied. Also, in this project, a network simulator NSIM-ACE is developed. It simulates behavior of packets for one-sided communications to study the effects of congestions on interconnects.